So if you have an HTC device with BlinkFeed on it and are currently in the US, UK, Germany, Taiwan, or China, expect to start seeing ads such as the one in the screenshot above very soon, if you haven’t already. The ads blend into the general interface of BlinkFeed, so at least they don’t look out of place. Then again, the fact that each one basically looks like a BlinkFeed story might confuse some people. 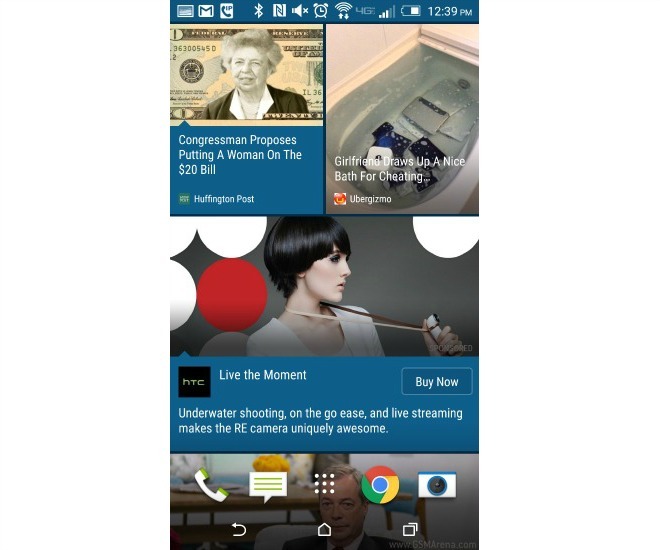 HTC says you’ll see promotions from ad network partners such as Yahoo, Twitter, and Appia. Alongside these you’ll get ads from HTC itself, for new devices or accessories which you’ll then be able to buy through the dedicated button. Thankfully, there will apparently be a way for you to opt out of receiving such promotional content inside BlinkFeed, but how exactly that will work hasn’t been detailed yet. HTC obviously hopes you won’t go through the trouble of disabling the ads. The company also notes that this is a pilot program, so it can’t say when or if the promos will be rolled out to additional markets.